It's difficult to do my "classically kosher" thing [which is to take classic Jewish recipes and update/modernize them with today's healthy options for less fat and oil] with something as classic and traditional as latkes, because the whole point of latkes is that they are fried in oil, to remember the miracle of the oil that burned in the Temple for eight nights instead of just one. Also, I can't fully support some people's crazy notion (most recently seen in the NY Times) that latkes are supposed to be fried in olive oil. This is a culinary falsehood. 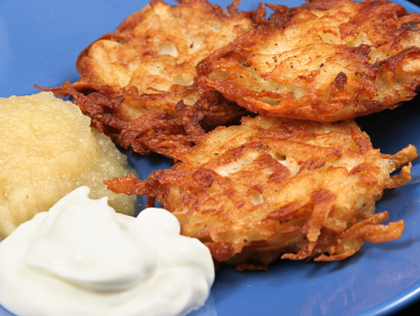 Latkes will simply not brown and crisp up well with olive oil, because olive oil has a low burning temperature. The corners are likely to burn before the insides are even done cooking. So forget about it and use vegetable oil! The one thing that I do actively suggest is to use Mazola Plus! vegetable oils, which are fortified with omega threes. 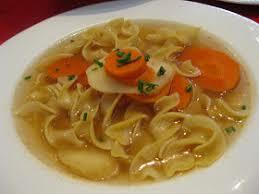 It is comparatively healthy and it tastes great. For latke frying, I would recommend Mazola's Corn Plus. Introduced in 2007, Mazola® Corn Plus!™ is a unique combination of pure corn and canola oils. It is a delicious way to cook plus it is a heart healthier option to other fats and oils. The pure, light flavor of Mazola® Corn Plus!™ is ideal for all types of contemporary cooking from salad dressings and marinades to cakes and cookies. Mazola® Corn Plus!™ is naturally cholesterol free and provides 600mg of Omega-3 per serving. And away we go with the world's best latkes, otherwise known as the best latkes ever (My mom's recipe, of course)! Not only is this recipe delicious, it's also easy. A freilichen Chanukah to everyone!! After you have grated or pulsed (grating will give you a lighter latke, pulsed will give you a more pancake-like potato pancake) the potatoes, place them in a sieve or spaghetti strainer to drain, or put them in layers of cheesecloth or paper towels and squeeze the water out. Mix ingredients together until combined. In a wide bottomed non-stick saute pan, heat vegetable or canola oil until very hot, and place either large or small spoonfuls in pan (depending on whether you want full size or mini latkes), and flatten only at the beginning. Don't crowd them. Wait until the corners have started to get very brown, and flip. When the latke is done, you will know because it will smell amazing and look crisp and delicious on both sides. When removing latkes from the pan, ideally with a slotted spatula, place on several layers of paper towel to sop up excess oil, and garnish with coarse salt. Keep in a warm oven until ready to serve! Serve traditionally with applesauce or sour cream (But I like them best plain). This recipe tends to make 12 large or 24 mini latkes.